FORT MYERS, Fla. - Mike Lowell thought about his hip almost constantly from Oct. 20 until yesterday. He thought about it when he walked on crutches, when he didn't believe the doctors who told him he looked great, when he woke up before dawn for rehab exercises. Yesterday, Lowell heard the ovation for him at City of Palms Park as he strode to home plate. He kicked at dirt in the batter's box. "See the ball," he thought. And that was all. Three pitches and two feeble swings later, Lowell walked back to the dugout, the only victory in his mind: He still hadn't thought about how his hip would respond in his first game since surgery last autumn to repair a torn labrum. In three at-bats as a designated hitter, Lowell went 1 for 3 and, more important, finished the day confident he will begin - and end - the season as the Red Sox' everyday third baseman. "I would say there would have to be a major setback or a car crash for that not to happen," Lowell said. "I'd like to play 150 games. That's normal. I don't think that's an unrealistic goal." The plan for Lowell's first spring training game called for two at-bats. Typically, pitchers begin spring training throwing mostly fastballs and slowly sprinkle in offspeed pitches, so hitters receive several games worth of fastballs before they face an array of pitches. Lowell, though, dug in against Baltimore Orioles reliever Brian Bass knowing he could see any pitch in his first at-bat. "Definitely a little added juice," Lowell said. Lowell looked at the first pitch Bass threw, an inside fastball for a strike. Leaning over the plate, he weakly popped the second pitch foul, high over the visitors' dugout. Bass then twirled a low, outside curveball, which Lowell flailed at for strike three. For Lowell, everything had felt fast. He knew he shouldn't have swung at the curveball. Lowell had not run even a step. Before his next at-bat, as he hopped up the dugout steps, he sidled next to manager Terry Francona. "If I pop up or something and don't have to run," he said, "I want a third at-bat." Three pitches later, Lowell popped up a Radhames Liz pitch to first. He carried the bat halfway down the first base line, staring up at the ball and jogging slowly. When it settled into Oscar Salazar's glove, Lowell shook his head, turned around, and trotted back to the dugout, no faster than his jog to first. He still had not run. "I actually jinxed myself," Lowell said. Francona granted Lowell his third at-bat, which came against Bob McCrory. With the count 1 and 1, McCrory threw a slider. Lowell beamed a line drive toward left. "Please don't get it, please don't get it," he thought as it zipped over the shortstop's head. Lowell ran to first, then exited for a pinch runner. 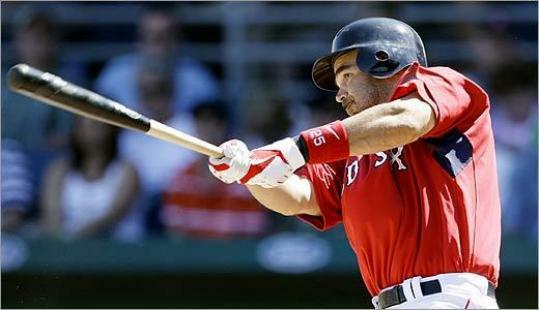 "I'd much rather finish on the at-bat I did than start on that one and end up with the other two," Lowell said. "It makes you go home a little better. "I still didn't have to beat out a ground ball or get to a double, so I knew it was going to be all right. But still, that twist on the swing and twisting back out to start running, it felt fine." Lowell, as planned, will debut at third base Friday in a night game against the Yankees. "I'm not anticipating any problems," he said. "But that little bounce you do before every pitch - there's going to be a lot of them. I'm actually looking forward to it." Progress has come quickly this spring for Lowell, the 2007 World Series MVP. For two weeks, he sprinted and shuffled for a short period before his joint fatigued. Lowell started swinging and fielding, eventually feeling discomfort only when he sprinted. On Sunday, he did his rehab exercises after baseball drills, not before them. Yesterday represented one final shift. He had been healing his hip. Now he is preparing for a long baseball season. He understands more challenges await. "The docs told me, after a year, I'm going to feel like new," Lowell said. "I think there's going to be points in a season where there's going to be a little bit of a grind. But I think the satisfaction I have is, structurally, there's nothing wrong. "I think there's always going to be questions, since we're in a little bit of uncharted waters. I don't think in Tito's mind, he has me slated for 162. I'm kind of curious to see how I feel after that six-month mark. I have felt so much better in these last three weeks, I'm hoping it gets more and more and more." Six weeks after surgery on Oct. 20, Lowell could barely envision himself even fielding a ground ball. He had last played baseball Oct. 5, in Game 4 of the American League Division Series. The pain in his hip forced him out of the playoffs. It dominated Lowell's life for more than four months. And then yesterday came. "I actually didn't think about it," Lowell said. "Which I think is a good thing."